Photo taken in June 2004. The Oregon Caves Chateau or The Chateau at Oregon Caves, (both names are used and there's a big debate about which is correct) is located adjacent to the cave entrance in the Oregon Caves National Monument. This has to rank as one of the best historic hotels I have every visited, not because of it's elegance, but because I have never found anything else remotely like it! The Chateau is a time machine set to take you to the 1940's. Looking for photos of the Oregon Caves adjacent to the Chateau? I have posted a few photos taken both inside and outside the caves on my Free Photos of Oregon Caves page. The Chateau opened in 1934 and the building is considered a masterpiece of the rustic architectural style. The exterior has steep shake roofs with multiple dormers of varying styles. The exterior walls of the building are covered with cedar bark stripped from nearby trees. A rock waterfall drops into a trout pond outside the classic diner-style coffee shop. 30 inch diameter logs support the ceilings, and a large double-sided fireplace stands in the center of the lobby. The dining room is separated from the lounge area (now a gift shop) by a stream. Yes, a real stream flows through the 3rd floor of the building! Rather than being built on a level spot like most buildings, The Oregon Caves Chateau was built straddling a steep walled canyon, much as a dam would be built across a canyon. The sides of the Chateau are anchored into the steep sides of the canyon. Being built into the side of a steep canyon creates an interesting effect. You walk into the lobby entrance from the roadway, cross the lobby to the picture windows overlooking the canyon and you realize that one side of this room is at ground level and the other side is 4 floors up from the creek-bed! The majority of the creek's water flows through a large pipe under the building, while a small portion of it is diverted into an artificial stream bed that flows through the dining room on the 3rd floor. The Chateau is 6 floors high from the creek bed to the top floor. The slope is so steep that the 1st, 2nd, 3rd, and 4th floors each have a ground level entrance! One of the most amazing things about the Oregon Caves Chateau, is that it is almost completely original. Most lodges and hotels get remodeled often, typically at least once every 10 years. The Chateau is far from the major highways that are the normal tourist routes through Oregon. The adjacent Oregon Caves are a tourist draw, but most cave visitors stop for a cave tour, then are on their way to other destinations. Thus the Chateau has suffered from low occupancy rates since it was built. The odd result of this is that the hotel became stuck in time. The original floors, stairs, wall coverings etc, have not worn out over the years like so many of the other grand hotels of the Rustic Design era. The Chateau has never had a major remodel. Entering the Chateau is like stepping back in time. Many of the walls have original finishes and very little in the way of modernization has occurred over the years. Almost all the rooms have the original furniture. The Chateau houses the largest collection of famous Monterey Brand Furniture in the world, most of it museum quality pieces. There are only a few "please don't sit on the furniture" signs, only a few very rare items are labeled don't touch! The furniture in your room is likely museum quality antiques. Radiators still provide heat for the rooms. The Oregon Caves Chateau, as well as a nearby employee dormitory and the "new Chalet" (the Oregon Caves Visitor Center building), were designed and built by Mr. Gust Lium (1884-1965), a local contractor who had an enormous level of design talent. His work stands up well against the great rustic architects of the period. He may not have gone to any of the big name architectural schools, but the man had a genius gift for design. The information above is just a brief overview. I'll go through much more information in the photo captions about the Chateau's history, architecture, and even Elizabeth, the local ghost! As with most of our photo tours these are our vacation pictures, we actually stayed in the Chateau a couple of nights so we could become familiar with it. Thus we are able to present more than the typical brief travel brochure talking-points babble. We interviewed several employees, old timers, architectural historians, and reviewed historic literature to create this tour. It is our hope this tour will wet your appetite and you will want to visit the Chateau in person. The proposed changes are to make life safety and deficiency corrections to the Chateau. As best I can tell by reading the Environmental Assessment created by the Park Service the following major changes are proposed, subject to funding approval. Due to funding constraints the work on the lower 4 floors may be done first, then when funds are available, the upper 2 floors of guest rooms will be corrected. Remove flammable existing interior fiberboard wall sheathing and replace it with fire-resistant material. In public areas the replacement material would be "similar in appearance to existing finishes." Remove all existing electrical and rewire the entire Chateau to current code. Existing decorative historic light fixtures would be rehabilitated. Upgrade the fire suppression (fire sprinklers) and alarm systems, install new fire doors, one hour fire walls, glass draft curtains (glass panels that hang down a foot or two from the ceiling to slow air movement into stairwells during a fire) and other fire barriers. Install new fire escapes on building exterior where needed and replace existing fire escapes using materials compatible with the historic appearance of the Chateau. Structural upgrades such as steel ties between beams, shear walls (plywood panels inside walls for earthquake reinforcement), insulation, replacement as needed of pipes, drains and heating fixtures. ABA compliance. Ramps up to the lobby door, between the lobby and 1st floor guest rooms, any place where a few steps are currently. An accessible path would be installed outside from the parking area to the front lobby doors. Modifications to the doors to allow easy opening, addition of hand rails, etc. to comply with ABA throughout the Chateau. Registration desk would be modified to meet ABA standards. Also a few stools in the coffee shop would be removed to allow wheelchair seating area at the counter. All 5 guest rooms on the 1st floor would be modified to be accessible. Create a new 2nd staircase between the 2nd and 3rd floors to meet fire & Safety codes that require to routes of access. The new stairway between the 2nd and 3rd floors will allow 2 rooms on the 3rd floor that were modified to be emergency exit corridors to become guest rooms again, increasing the total number of guest rooms to 26. Additional funding has been secured through the efforts of the Friends of Oregon Cave and Chateau from the Oregon Lottery to recreate the 3 balconies that were originally on the back of the Chateau but were removed after being damaged by snowfall.This would be steel framed balconies to withstand the snow weight disguised with wood sheathing so as to look like the original wood balconies. The official website for the non-profit Oregon Caves concessionaire (lodging, gift shop, dining room, deli & the Caves Diner) is: Oregon Caves Chateau. The Chateau is open May through October, check with them for the exact dates. Reservations on-line or phone: (877) 245-9022. Popularity has increased for the lodge, during summer season, particularly on weekends, the Chateau often sells out the rooms. From October through May (when the Cafe is closed) snacks and beverages are sold at the Park Visitor Center bookstore. The Oregon Caves and the Chateau are a bit off the beaten path, but well worth the detour and time. Lack of visitors makes operating the Chateau very financially challenging, and it just barely survives. If you are in Southern Oregon please try to stay at the Chateau or at least have lunch or dinner there! Unlike most National Park hotels, the Chateau is operated by a non-profit organization and it is expensive for them to keep it open. By visiting and spending some money you are helping preserve a little-known national treasure! 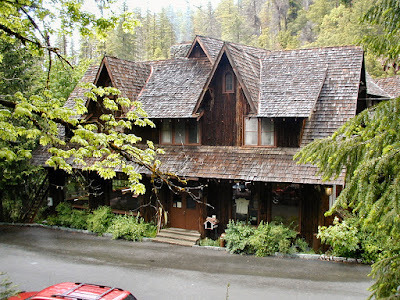 The Chateau at Oregon Caves is a historic lodge. Staying here is like stepping back in time to 1937. This lodge is almost 100% original with very few modern updates to the structure. You should be prepared for a historic (that means old!) lodge that does not meet the latest standards for hotel facilities and architecture. Rooms are comfortable but simple, some people would consider them primitive. The staff is very friendly and helpful, they treated us like old friends on our first visit! Consider that staying here is an adventure, something different, out of the ordinary, and unique. If you don't find staying in an old lodge your thing, then you might want to just make it a day visit. While a day visit isn't the same as staying the night, you can get a good feel for The Chateau by walking through it and enjoying a lunch and/or dinner here. Once again, I don't want to scare you off. The Chateau is a great place and I highly recommend you stay here! There are no telephones or televisions in the rooms. Heat is by steam radiators, and like all steam systems the pipes moan, groan, bump and clunk. The walls are thin, I suggest ear plugs if you are a light sleeper. The Chateau does have a fire sprinkler system, which is important in an old wood-frame hotel like this one. There is no air conditioning, but it is seldom needed as nights tend to be cool. Just open a window and cool the room the old fashioned way. In-room amenities consist of an ice bucket and drinking glasses, also the basic soap, shampoo and clean towels. If you want a hair dryer bring one with you. There are no in-room appliances, no in-room coffee. Watch that you don't overload the electrical circuits if you bring your own personal care appliances. You can generally request a specific room when making reservations by phone, although they don't guarantee you will get the room you request. Quieter rooms are numbers 210 and 211, they do not have other rooms above or below them and are isolated by closets or bathrooms from the other rooms, and there are no shared walls by the beds. Rooms 204 and 205 are almost as isolated but do have rooms below them. All four rooms just mentioned are corner rooms with multiple windows and good views of the surrounding forest. Other rooms are less isolated but more unique. See the photo tour for photos of a few of the more interesting rooms. The dining room at the Chateau features local Southern Oregon regional cuisine. To the extent possible, all food is obtained locally. The food is excellent, service is great, and there are few other places you can dine while listening to the gurgling sound of a stream. Yes, part of Cave Creek flows through an artificial stream bed built into the floor of the dining room! The dining room menu is usually posted on the Chateau's website. The Caves Cafe Coffee Shop in the Chateau serves standard coffee shop meals in a late 1930's era setting. Chrome counter chairs with red vinyl seats create the perfect "soda shop" atmosphere. If you do nothing else, have lunch, hot chocolate, or a milk-shake at the coffee shop! The Caves Cafe menu is posted on the Chateau's website. The Caves Cafe was formerly called the Caves Diner. Deli sandwiches, salads and ready-to-go food items are available in the gift shop. Visitor facilities are also available in the community of Cave Junction. There are two national forest campgrounds nearby, Grayback and Cave Creek. Minimal services at both. Cave Creek Campground can't accommodate large vehicles. See the Forest Service Website and do a search for the campground name for more information on campgrounds. There are private campgrounds with hook-ups around the town of Cave Junction. Trailers are not allowed on the final few miles of the road to the Chateau due to very sharp curves. A trailer parking area is provided at either the Illinois Valley Visitor Center in Cave Junction or the Grayback Campground near the monument. Unless you need your trailer (ie; you're camping at Grayback) it is best to leave it at the Illinois Valley Visitor Center parking area. Don't waste fuel and time towing it up the narrow road to the campground, where you will have to unhitch it anyway so you can drive the last few miles. Leave your trailer in Cave Junction! The nearest airport with regularly scheduled air service is the Jackson County Regional Airport in Medford, Oregon. Rental cars are available at the airport. The caves are a 2 hour drive from Medford. The Oregon Caves Chateau is located in the Oregon Caves National Monument. 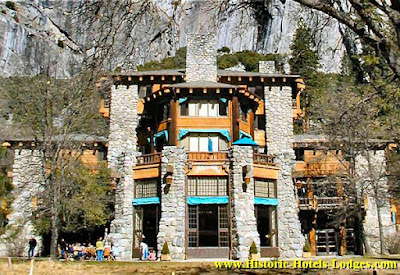 The Chateau is owned by the National Park Service and operated by a non-profit organization under a special use permit. Where are the actual Oregon Caves? Right across the road from the Chateau! If there weren't trees in the way you could throw a rock from the cave entrance to the Chateau. But please don't try! There is a lot of controversy surrounding the history and especially the management of the Oregon Caves National Monument. There's even disagreement on the official name of the Chateau; Oregon Caves Chateau vs. The Chateau at Oregon Caves! My photo commentary and the references listed here generate more comments and complaints than any other hotel or lodge I have written on. It seems that someone, somewhere, disagrees with something in every article, website, and book written on the Oregon Caves! I'm interested in hearing from anyone with something to offer, and I will add any authoritative works to the reference lists below on request. I'm not an expert on the Chateau or the Caves. I have tried to note in my photo captions the things that are controversial. I will continue to update the website as I learn more, while trying to stay as neutral as possible! I've probably invested over 100 hours of my time into this article on the Chateau. The Chateau is one of my favorite lodges and I want to get the facts right, but I can't make everyone happy. Thanks for your patience. The Oregon Caves Chateau is the crown jewel of a larger group of historic buildings called the Oregon Caves National Monument Historic District. There are 4 primary historic buildings of interest at the Oregon Caves National Monument Historic District; The Chateau (a hotel built in 1934), The Ranger Residence (1936? ), The (new) Chalet (cave visitor center built in 1942), and the old employee Dormitory (1927, with major additions in 1940 & 1972). The Chateau, Dormitory, and new Chalet were designed and built by Gust Lium (1884-1965), a local contractor. The new Chalet replaces an older Chalet building that was at the same location. In addition Mr. Lium designed and built a number of cottages (1926), which were removed in 1988. The Ranger Residence was designed by Francis Lange of the National Park Service. My focus for this website is on The Chateau, which was designed and built as a visitor hotel for the park. Oregon Caves National Monument. The Official National Park Service website. The Oregon Caves Chateau Homepage. Hotel information and reservations. The official website of Oregon Caves Chateau, the Chateau operator. Architecture in the Parks- Oregon Caves Chateau. An excellent historical piece on the Chateau by the Park Service. Do a Google search using the report name. Cultural Landscape Report. This is an excellent, in-depth report on the historical buildings and landscape of Oregon Caves. Lots of historic photos. By Landscape Architects Cathy Gilbert and Marsha Tolon of the National Park Service. Floor Plans of the Chateau & Chalet. Click on the link at left, then enter "Oregon Caves" into the search box. This will give you links to copies of the floor plans for the historic buildings at the Oregon Caves, as well as photos of the old guest cabins take prior to their removal. Library of Congress, Prints and Photographs Division, Historic American Buildings Survey or Historic American Engineering Record. Chateau Accessibility and Safety Study. Prepared by Architectural Resources Group, 2006. Primarily recommendations for repairs to the building, this document also contains a brief history with time line and a good description of current conditions of the Chateau. Note: large file size- 8.9 mb. Oregon Caves Chateau Historic Structures Report. By Alex McMurry, the School of Architecture and Allied Arts, University of Oregon, June 1999. Correct Life Safety and Other Deficiencies in the Oregon Caves Chateau Environmental Assessment. This is the document outlining the proposed (in 2018?) remodel of the Chateau. Domain of the Caveman: A Historic Resource Study of Oregon Caves National Monument. Written by Stephen R. Mark, a National Park Service Historian. If you're interested in the history of the Chateau and the surrounding landscape I highly recommend this book. It is one of the books in my collection. Oregon Caves Discovery and Exploration A history of the caves by William R. Halliday and Frank K. Walsh. Presents a different perspective on the cave history from that of the park service book above. Out of print but may be available used. Oregon Caves - The Pioneer Exploration and the New Discoveries by Steve Knutson. A history of the Oregon Caves. Oregon Caves Chateau, Stephen R. Mark, National Park Service, Dr. William R. Halliday, and of course my wife Julie, who puts up with my love of old hotels, and the enormous amount of time it takes to photograph them and write these articles.